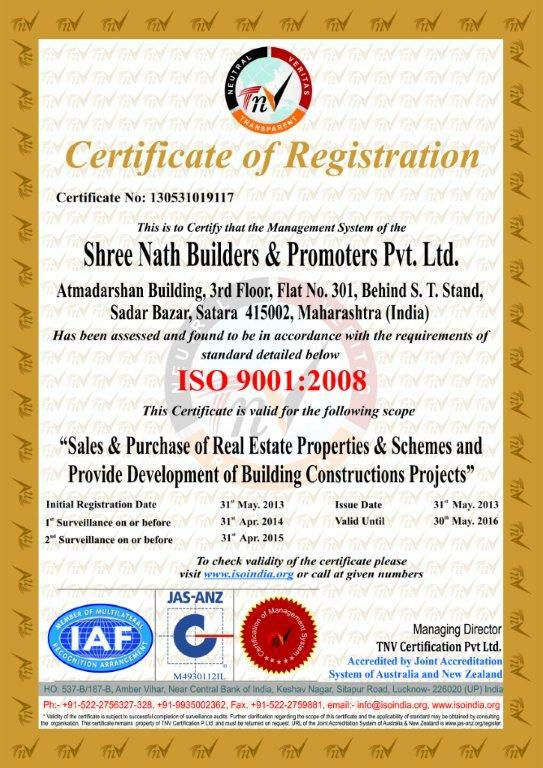 Shreenath Construction was founded by group of experts from industry Registered as an ISO 9001:2008 company. The company is managed by highly qualified professionals and experienced business individuals who are focused to ensure that the company maintains its high standards in quality construction, timely delivery and customer satisfaction. Known for properties with state-of-the-market infrastructure and amenities. The scale of our reach is continuously expanding with commitment to strive for continual improvement in our overall processes to ensure sustained and consistent quality of our products and services. With all the business expansion the company for sees The company believes we are still learning and nurturing the young organization. With a positive attitude geared up to take on the future head on. To provide a secure and affordable constructions which gives value for money & a lifestyle which is address of sophistication that achieves the aesthetic heights as well as functional satisfaction. © 2013 Shreenath group. All rights reserved.